Knife of Never Letting Go By Patrick Ness Supplemental Novel Activities: Book one of the Chaos Walking trilogy, The Knife of Never Letting Go, by Patrick Ness, is an excellent novel for reluctant readers, especially boys. It ties in well with any dystopian, choices, or coming-of-age novel unit for whole class reading or indivdual choice reading. These activities are aligned with the ELA Common Core State Standards for reading, writing, and language in grades 11-12 and 9-10. UPDATED with an additional 30 pages of materials! 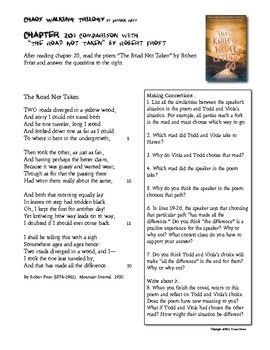 One activity has students making connections between the novel (chapter 20, in particular) and Robert Frost's "The Road Not Taken" poem. It also poses a writing prompt at the conclusion of the novel. 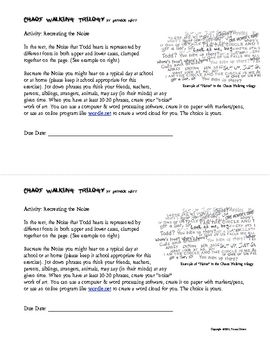 Other ELA activities include researching etymology of words and creative writing exercises. 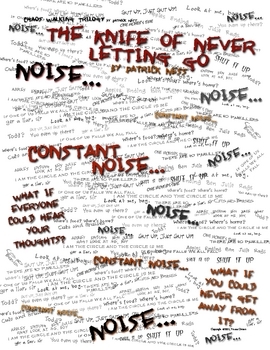 Art - recreating your "Noise." Separate teacher guide with answer key is included. 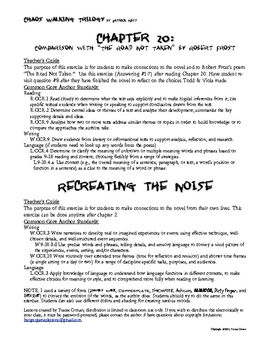 Also included is a one-page printable to hang in your classroom depicting the noise and questions to ponder as students read.